Looking for another way to get healthy coconut products into your diet? You must give these cookies a try. 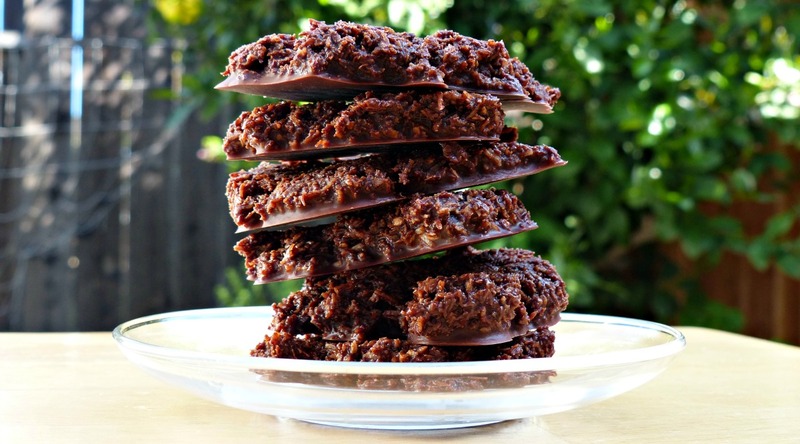 Dense, dark and chewy, these no-bake chocolate coconut cookies are packed with coconut oil and shredded coconut so they make a healthy and delicious addition to any meal or snack. These cookies are 100% real food, but in my experience they also get rave reviews from eaters who don’t adhere to a real food diet. I’ve taken them to several “normal” parties and always receive compliments on how delicious they are. This is a fantastic cookie recipe to make if you’re short on time and/or don’t want to heat up your house by turning on the oven. Ingredients merely need to be melted and mixed on the stovetop, then spooned out and frozen before they’re ready to eat. Shredded coconut: I highly recommend buying shredded coconut online. In my experience, buying it in bulk is WAY less expensive than buying small packages at the grocery store. (If your local store has a great bulk section, that may be an affordable option, too.) I usually buy this shredded coconut. Cocoa powder: I always use raw cacao powder in my recipes, but any kind of cocoa powder will work, too. Like the shredded coconut, I highly recommend buying your cacao powder in bulk, if you go through a lot of it. I usually buy this cacao powder. These cookies need to be stored in the fridge or freezer. While you can leave them out for a short time while serving, they WILL melt if left at room temperature for long–particularly if it’s a hot day. These cookies are packed full of coconut oil and shredded coconut. If you’re new to coconut products, you should know that eating too much coconut oil (or other coconut products) at one sitting can cause intestinal upset. How much is too much seems to vary from person to person, so although these cookies are delicious, I wouldn’t recommend eating more than or two at time. If you want, you can then experiment to determine your own coconut tolerance level. Want to See Me Making These Cookies? I made a video to show you just how EASY this recipe is. Click on the video below to watch! You should definitely check out some more of my coconut-rich recipes, like my coconut oil fudge, chocolate coconut fat bombs, coconut berry delights, lemon coconut delights, and homemade mint chocolates. And if that’s not enough, I also have a whole e-book dedicated to coconut recipes. Check out the e-book here. And now, onto the no-bake chocolate coconut cookies! Add all ingredients except shredded coconut to a saucepan and gently melt until all ingredients are liquid, then use a whisk or fork to stir until all ingredients are evenly mixed. Line a flat surface, such as a cutting board, with wax paper or parchment paper. Spoon cookies onto paper. You can make them smaller or larger depending on your preference. If cookies seem too liquid, allow mixture to cool a bit on the counter or in your fridge before trying to scoop them again. Place cookies in the freezer to harden. Once hardened, remove to a lidded container. Store container in the freezer or fridge, depending on your preference. These were great! Thank you for this yummy recipe! I did them in mini-muffin tins and did mostly stevia for the sweetener. Thanks again! This is great, hubby can't eat starch and misses almond joys. I can see adding nuts and dried cherries or cranberries too. Xylitol or even coconut Palm sugar and a small amount of water would work well too if you wanted a low glycemic sugar vs honey. These are SO good! My kids love them! These were so delicious. They were super fast to make. I always have these ingredients on hand and they were chewy and delicious. Thank you so much. My husband even went back for seconds which he never does. Thank you!!!!!!! could you add nuts to this as well? that sounds good to me? I don't see why not! You'd probably have to add more oil (and potentially more cocoa powder and/or honey) to make sure everything stays together well. I made these last night!! So quick, easy and delish!! I actually added oatmeal to one batch instead of shredded coconut and they tasted just like a Girl Scout Samoa cookie!!! thanks for sharing! These are amazing. My only feedback would be to add a cooling period before spooning the cookies onto the parchment/wax paper. Mine must have been too hot so when I tried peeling them off the wax paper, a bunch of melted wax paper came with them! Make sure you use parchment paper, not wax paper. I made them a little different..I just spread the entire mixture over parchment paper (made a rectangle more or less) and put it in the fridge like that...then removed and cut into little squares. Me and my little one love them! I can't wait to make these as a Valentine's Day treat for my hubby and me :) These sound delicious!!!! These were super easy to make. Love that! The only thing is they were a bit thin and drippy - I even chilled the mixture in the fridge before putting on parchment paper. It made only 11 cookies for me - how much should it make? These are delicious! I made them as a treat when my daughter had a friend over who is dairy/nut free. I added rice krispies because I had them on hand and they added a little crunch. Second batch I added pecans and dried cranberries, we love them! I'm so glad you liked them, Amy! Those are some great additions you came up with, too! I've been meaning to try these forever and we finally made them this morning. WOW!!! Delicious! Thanks for a great recipe! Thanks, Susannah! I'm so glad you liked them. It depends on how big you make them! You can make them as large or small as you want. I often do 12 large cookies. AWESOME ...I always hate it when people modify the recipe but had to make these and didnt have honey so used agave (plus I am vegan). I did add crushed walnuts to some of them. These were SO easy to make (too easy!!). But for some reason I only like ended up with 8. They weernt that big. But perhaps they were? Anyways..thank you!!! Glad you liked them! Yeah, it's not a very large recipe. If I'm making them for a crowd I usually make a double batch! Thank you for this recipe! I absolutely love them and I've made them for others who have begged for the recipe. It's one of my favorites!